Our cut away section details make understanding the product a simple process. We can illustrate what materials will be used, what colors are specified, the type of illumination to be used as well as the method of installation including the fastening system. Our technical diagrams can be as simple or as complex as needed. We pride ourselves in showing the client, property owner, and permitting offices exactly what we are manufacturing and installing. 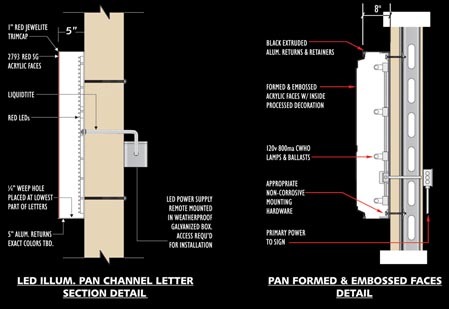 Whether your sign is a backlit cabinet, non-illuminated cabinet, or an internally illuminated channel letter, we can show you our assembly method, mounting method, and the power-supply method. We take the guesswork out of your project, and make the entire process simple.